This series was shot entirely on location in and around the scenic Ring of Kerry in south west Ireland, providing Alywn and his wife June, with some fantastic landscapes and scenery to paint. Acrylic paints combine the best aspects of oil and watercolour, as well as having their own unique qualities. This DVD provides a step-by-step guide to the techniques and materials needed for painting in acrylic and the eight chapters combine to make a complete course. A wide range of locations and subjects are painted, including the inside of a pub, a still life of flowers, thatched cottages and the famous Lakes of Killarney. Alwyn and June each paint the same scene, the village of Caherdaniel in Co Kerry, to illustrate the different effects which can be acheived using acrylics. To demonstrate the importance of scale n a picture, Alwyn and June visit different locations to paint cottages and mountains, with fascinating results. Still life subjects are always popular and Alwyn demonstrates various useful techniques while painting some flowers. As he does this, June paints Alwyn painting. The famous 'Ladies View' of the Lakes of Killarney is the subject of this chapter and suggests how to approach such a large subject. Alwyn and June visit Derrynane Harbour on the Ring of Kerry for a day's sketching. Flowers and boats, mountains and waves are their chosen subjects. 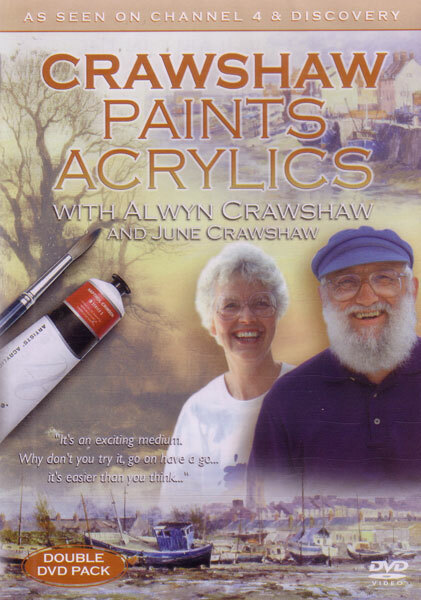 Alwyn and June visit one of Europe's most westerly points to paint the same subject in acrylics and watercolour to demonstrate the different results obtained using different media. A traditional Irish pub is the location for this programme as Alwyn paints the bustling pub interior, while June concentrates on a portrait. Overlooking the village of Sneem, Alwyn demonstrates how to turn a potentially difficult subject into something more manageable.